Discussion in 'Content / Copywriting' started by JamesBlake, Jan 24, 2018. Tired of missing out on the money using poor or mediocre quality content leaves on the table. Tired of using services that promise a lot and under deliver. Interested in seeing what top-notch content can do for your website’s authority as well as its earnings. You’re probably asking yourself, what money is this guy talking about? Websites that use subpar content tend to rank less, convert fewer visitors into leads/customers, and have higher bounce rates. Comprehensive content leads to content that your site visitors want to share or find interesting/helpful. The more value you provide them, the more financial value they will provide you in the long term. To put it simply, better quality content not only saves but also makes you money in both the short and long term! If you’ve seen my name around the forum, chances are it's for this thread. I have been a copywriter and content marketer for a while. I help people make money, that’s just what I do. I want to help your sites, your projects, etc. etc. MAKE MORE MONEY. What do people say about my previous service thread? And that's just a few recent reviews. Now, I have revamped my service offering and pulled together a few resources to create a responsive, premium research, carefully crafted content service. What makes my service so much better than the others? My staff is exclusively college-educated native English speakers from Canada, Australia, and the United States. The most in-depth research from authoritative and direct sources. As quick as 12 hour turn around time on orders of 5,000 words to max 3 day turn around on orders up to 30,000 words of premium content. We are capable of quickly handling emergency orders for a small premium. You’ll know who is handling your orders. Most of the time, it will be me myself handling them, and I will be contactable at all times via skype. Regular clients WILL have priority, but even the occasional buyer will see the highly responsive thorough customer service experience my team offers. We write ebooks, Amazon content, niche content of any kind, sales pages and more! Alright, Alright, You’re Great, What Are The Prices? We’re not cheap. We work harder, longer, and more effectively than any other team of our kind. From beginning to end, we craft your content to be thoroughly researched and as interesting as possible. 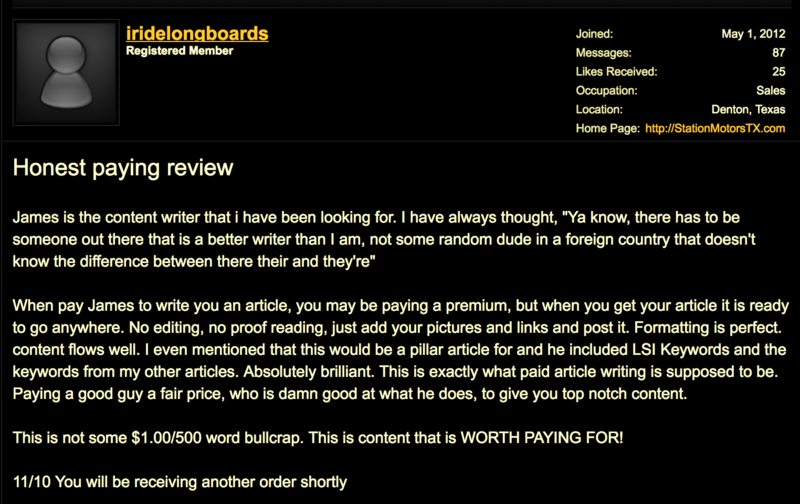 For our basic content reviewed by one of our editors and completed within 48 hours: .03 cents a word is the going rate. For our premium content package which includes a further ideas document and things to consider along with your content, it’s .05 cents a word. Sales pages and special orders must be discussed in depth for a more accurate quote. Customers who order above 10,000 words a month receive a discount and a dedicated contact that is available for questions 24/7. Send an email or PM with your project details. Post your confirmation # in the comments of this thread. You’ll receive a follow-up for clarification. If you have a special project, feel free to contact me via PM or email and I’ll get back to you within 6 hours maximum. If you would like to see a sample package, send me a PM or comment below. Comment below and I’ll reach out to the selected members. TL;DR: Don't miss out on making more money from your sites by having great content. I'm impressed with the service overall - OP provided me with high quality and engaging articles. The content being provided is run through Grammarly to check for errors before being delivered. I received a good level of support with fast response times from the seller. Alright folks, giving away eight 1,000 word articles on any topic away as review copies for people with above 100 posts. I'm in for a review copy. I am in for the review copy. Count me in for the review copy. Tested few other services of content writing, let's see how this one goes! If I like, I would definitely recommend and order more to my colleagues! I will Take The Review Copy. In for a review copy. Would love to test out your service. Great! All of the regular member review copies are now taken! Check your PMs! Would love to review this, thanks. @JamesBlake, @Sherb and a quite sensual trex are the three guys I look up to the most when it comes to content writing on bhw. James inspired me to post in the decrepit article writing section with one of his threads on how to break out of the $$$(something along these lines) so he gets my full vouch as an excellent option for your website. Forgot to mention @Apricot, everything she posts is gold, structure wise that is. I will take a review copy if available. I take a review copy if still available. Hey, need to update/make longer version of my actual authoritative content on one of my sites. See that all review copies are gone. Discount in exchange for honest review? PS: around 1000 words needed.